KEEPER OF THE SNAILS: Gate: a Norwegian Connection. 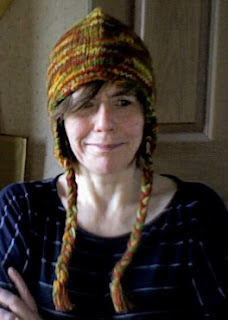 Hodmandod Senior has just come back from Norway with this hat. I expect David Crystal could tell me. 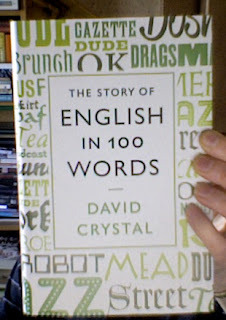 He is the author of The Story of English in 100 Words which came through my 'house-gate' this week from Profile Books. I am a fan of Professor Crystal. As well as writing really interesting books on the English Language, he is an equally entertaining speaker. Chester was packed for his last talk in the Literature Festival, and he is coming to Chester again this year. His latest little book is a gem of an idea. Using examples, he describes the history of the language from its huge variety of sources: from the first word written found inscribed in runes on a piece of deer bone dating from the 5th century 'roe', to the more recent 'twittersphere', with which I expect anyone reading this blog will be much more familiar. Inbetween there are a host of little oddities like 'Dude' (a cool usage) and 'Fopdoodle' ( a lost usage) - a treasure house for any lover of words. * A search on the origin of the words show that the 'gate' meaning street does indeed come from the Norse (and presumably arrived with the Vikings, only appearing in writing dating from the 13th century- other examples in David Crystal's book are 'skirt' and and 'take away'); whereas 'gate' meaning door in a wall comes from the Anglo-Saxon and are therefore Germanic and appear much earlier (other examples include 'roe' as before, and also 'and', 'out' and 'what'). It is, Lizzy! It's great for dipping in - you learn something interesting each time.